I finally finished reading Donna Tartt’s stunning (and hefty) novel The Goldfinch. I had it signed out of the library for two weeks only and, at over 700 pages, reading that sucker took every spare minute I could find of those two weeks. But more on that later. 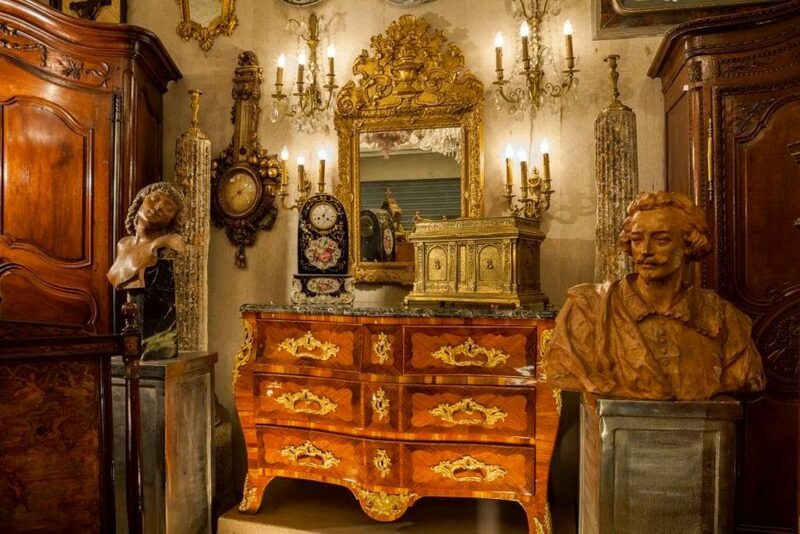 The novel, or rather Donna Tartt’s exquisite description of Hobie’s magical shop in the novel: “…a wilderness of gilt, gleaming in the slant from the dust-furred windows: gilded cupids, gilded commodes and torchieres…” awoke in me a longing for the days when my friend, Mary, and I made almost weekly forays to local antique fairs and flea markets. In some places we simply admired the artistry of the shop owners, and how their skilfully arranged merchandise recreated a tableau of days gone by. And in other places, we sifted through dusty piles of blue and white china or untangled drawers of old necklaces and bracelets in hopes of finding a treasure. Something that we could rescue from the junk pile, and take home to polish up and admire. Sometimes we visited shops like this. More often we were drawn to places like this. My friend collected snuff boxes and antique goblets of various designs. I bought old painted tins, and small chests of drawers… and sometimes even large ones. 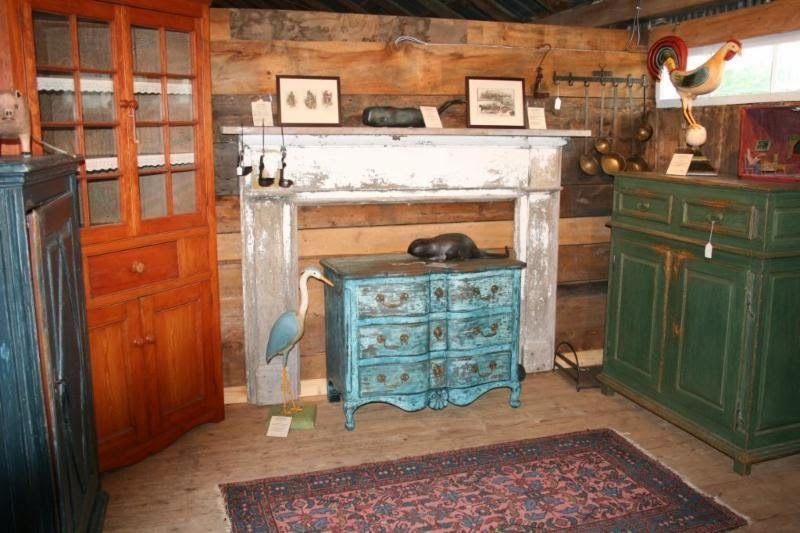 I love distressed wood, and old painted furniture. And weird little doo-dads. I’ve always been attracted to old things. 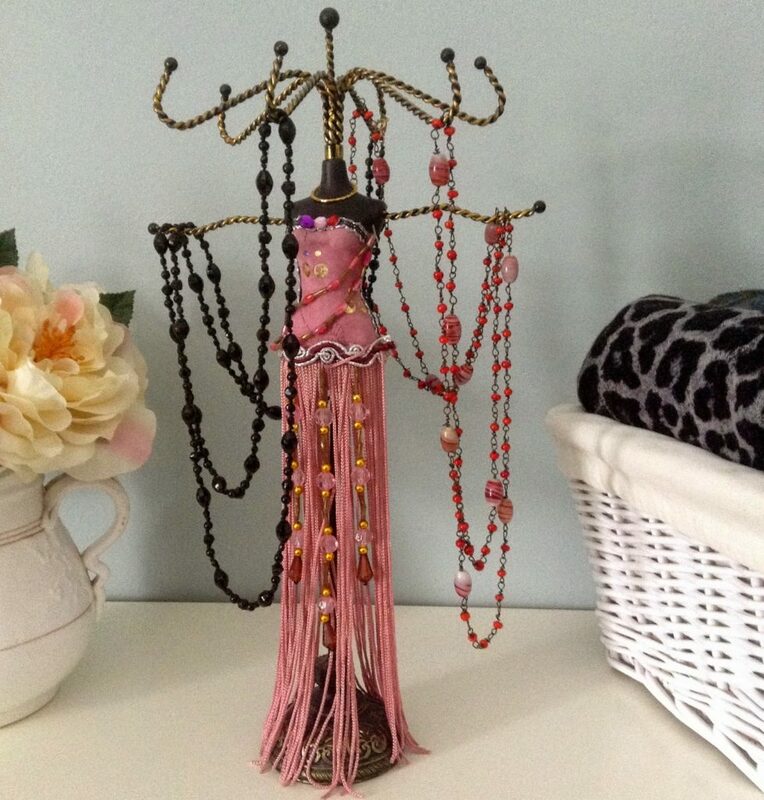 Furniture that has a “back story”, so to speak, or jewellry that was worn by my mum or grandmother, or even by someone I never knew. There’s a kind of magic about things that have been around for so long, if you’ll pardon the rampant romanticism. Our favourite shop of all was a place called “Now and Again” in the historic, little town of Merrickville, on the Rideau. We made the forty minute drive to Merrickville regularly for years. Every time, and I do mean every time, we drove along the back road that followed the Rideau River, admiring the stone houses, we would try to remember the name of that darned store. “I’m excited to see what they have at ‘Time and Again’,” Mary would say. “It’s not ‘Time and Again’… it’s ‘Time After Time’… isn’t it?” I’d reply. No? Is it ‘As Time Goes By’? ‘Now and Then’? And then we’d start laughing and try to come up with as many names as we could….which, of course, just made it totally impossible to get it right. This shot below, kind of reminds me of “Now and Again.” They always had a clever assortment of small furniture, collectibles, vintage jewellry, and hats. This is where my vintage hat obsession was born. I also bought my first few pieces of vintage jewellry at “Now and Again.” A long red and white beaded necklace from the 1920’s. I think the owner said it was Venetian glass, but I can’t really remember. I just loved it; I still do. 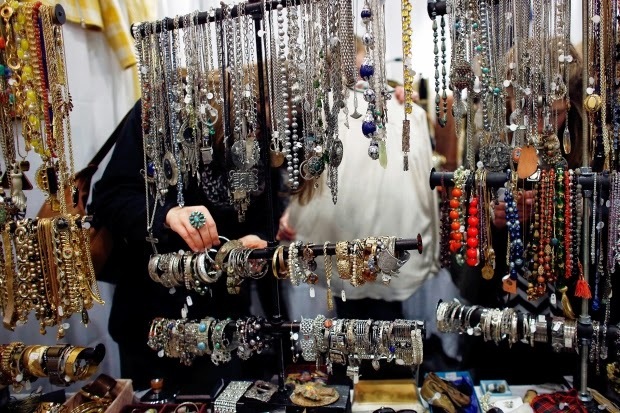 Nowadays, I look for old jewellry at the Ottawa Vintage Clothing Show. I wrote a post about the show and about some of my vintage brooches and bracelets and hats back in November; you can read that here. This is a shot of my two favourite vintage necklaces. The long red and white flapper beads that I bought at “Now and Again,” and a black, jet necklace, from the 1930’s…. I think. I still wear them both quite a bit. The black jet necklace with my black leggings, cream sweater and white tee shirt, and my long, black, leather-trimmed jacket from Elie Tahari. Oh…and my new-ish black and cream Kate Spade purse… a real steal that I snapped up at a Florida outlet last winter. And both necklaces together, with this outfit from a previous post, where I’m trying to rehabilitate my short, black Theory jacket by combining it with a Gap tee, my leather pants and my Stuart Weitzman loafers. Another favourite necklace is one that I bought at the Vintage Clothing Show, but which is not old. Well, not exactly. It’s just made from old bits. I had kind of forgotten I even had it until I was trying to think of ways to get more wear out of these brown boots. 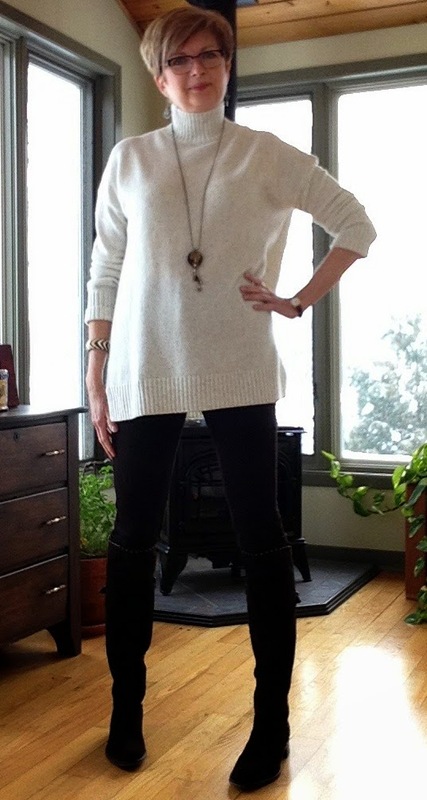 The boots and brown pants looked good with my cream Gap turtleneck…but the outfit needed something dark against the sweater, and so I thought of this necklace. I bought it at the Vintage Clothing Show, sometime in the nineties. I love this piece because it’s unique. And quirky. It’s made from an old, round, hammered-flat, metal bottle cap, another small piece of hammered metal, miss-matched links of chains with nuts and washers and even a tiny bit of rhinestone. 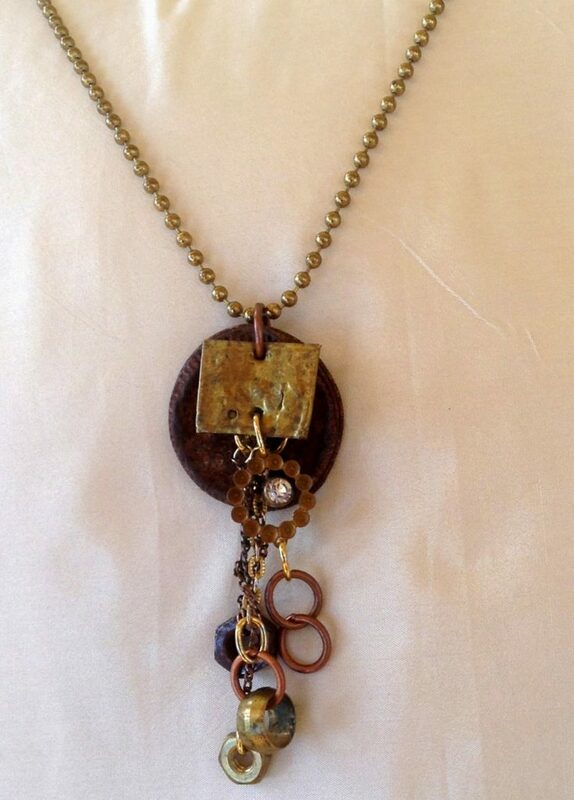 And it goes perfectly with a pair of earrings made of old coins that I’ve had since the eighties. We’re off to France for a month this spring. I’m very excited. Not just because it’s France, which is wonderful. But because we’re spending a week in Paris. It will be my first time in Paris. The Eiffel Tower and the Louvre, Hemingway and Shakespeare and Co, the home of Chanel and Dior and Celine. And the Marchés Aux Puces. 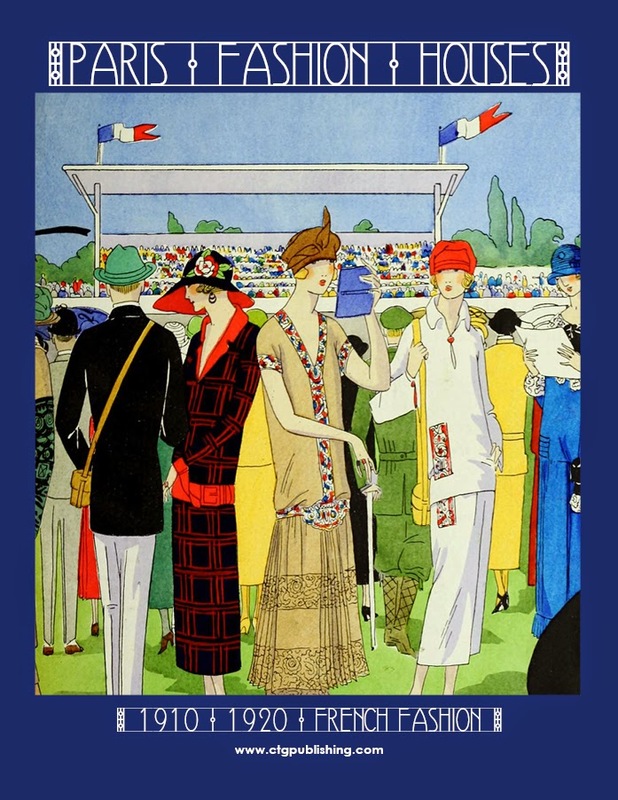 Ever since I read Anne Tyler’s book The Accidental Tourist (on my friend Grace’s recommendation)… I’ve wanted to visit the flea markets of Paris. Do you know the book? There’s a wonderful scene near the end where Muriel lugs bags and bags of treasures, that she bought at a flea market, back to her tiny Paris hotel room, and spills them all out on the bed. Okay…. so I don’t plan to buy bags and bags of things. Hubby eyes would roll so far back into his head that they would stick there for sure. And we can’t have that. If you’ll pardon the rampant romanticism, again. Are you a lover of vintage things? I love vintage and new..! I do go yo auctions but am strict about limits otherwise you get carried away. I must say you are working those leather pants! 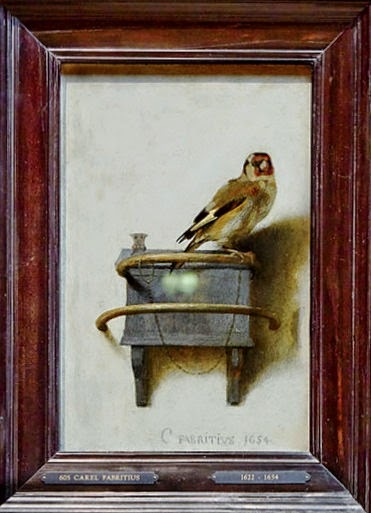 Ps I just saw the goldfinch in person last week and it was stunning. I used to set myself limits at auctions as well…but haven't attended one in years. I got too tired of sitting through the sale of sooo many items that did not interest me. Wow… how exciting…to see the original painting. I'd love to see it! Me too Wendy…I have to limit myself to jewellry now. The house is too full of old things that I can't bear to get rid of. I must try that trick to see if my necklace is in fact jet. We spent several wonderful days in Whitby in 2005, loved it there. We stayed at a lovely B&B on the West Cliff (I think) called the Rothbury. I kept expecting to bump into Andy Dalziel …or at least Warren Clark! haha. Thanks Iris. It's funny how when you start writing one thing leads to another. You may ask….I'm 5' 7.5". Or so…I seem to have lost a quarter inch in the last few years. Thanks for reading! Yay! So glad to hear your plans for France are moving ahead. I'll be following with interest. Thanks. I'll let you know more details about our plans when we've finished planning. Loved your garden shots the other day…totally envious considering we're deep in snow! I do love vintage! 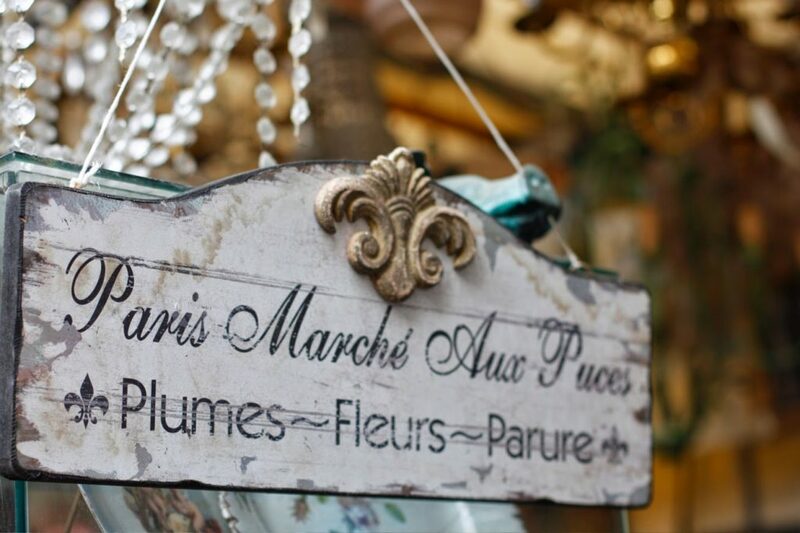 And who wouldn't get caught up in the romance of finding the perfect trinket in a Paris flea market?! Love your red vintage Venetian beads! Thanks so much for joining FUN FASHION FRIDAY! Hope your weekend is wonderful! Thanks Dawn. Same to you. Another deee-lightful posting, Susan. After many years of collecting and inheriting antique things of all sorts, we downsized, which means I have to limit myself to jewelry…which has been a life-long passion. 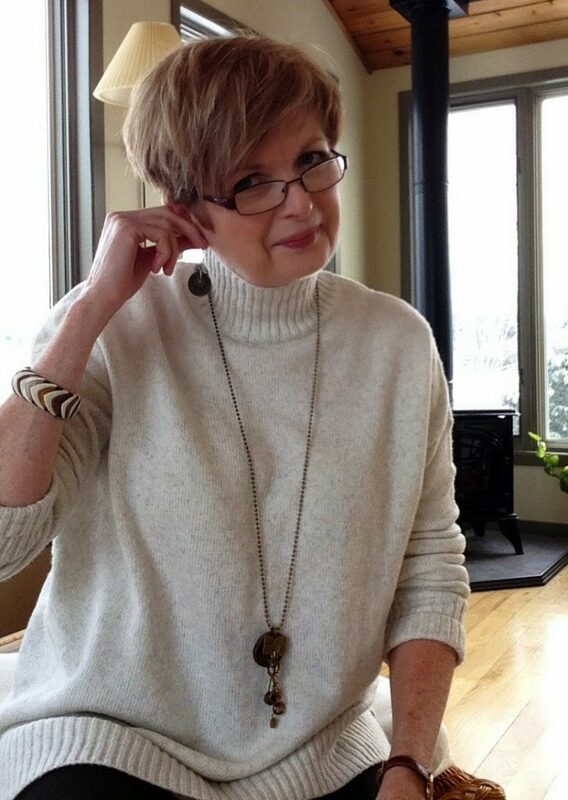 For the past 15 years, I have been making jewelry for myself and for clients and I often incorporate bits and pieces I have picked up at the flea-markets and antiques stores in coastal Maine and in New Brunswick. All three of your necklaces are lovely. Is the black one knotted? You will have lots of fun in Paris. No the black necklace is not knotted. That must be so much fun….making new jewellry from bits and pieces. I wonder if you've heard of Anne-Marie Chagnon from Montreal. Her jewellry is made from beads and metal and all kinds of interesting things. I love her work. Btw … where in N.B. do you live? Ahh, a vintage necklace is my favorite piece to scout out at the antique stores (I can fit them in my car, for one thing! : > ) Your are lovely, as are your smart outfits. Thanks for sharing with Visible Monday, xo. Thanks Patti. And they fit into my house a lot easier too! I've never been one for vintage stores – or even for buying house goods of any sort unless absolutely necessary. But that is changing. I'm even thinking of buying something from eBay. Your finds look good with your outfits – you have such great style. And Paris? You've never been? Ah, well, it is astonishingly beautiful no matter what you do there. Enjoy! Thanks Lisa. I'm excited about our trip! I'm not sure if I'm a lover of vintage things but I do like finding individual items that suit that style. 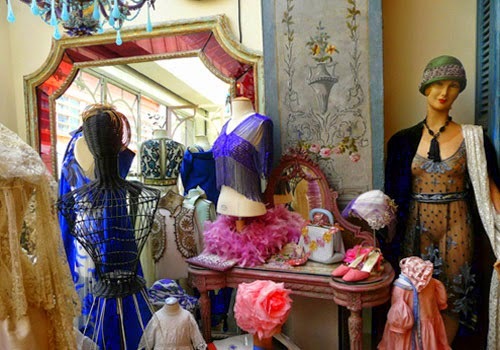 I do like French fashion and interiors however, and I love Paris! What's not to love about Paris, eh? Well…I guess I'll find out in May. Thanks for reading, Lorna. Thanks. It will be great!